If you enjoying a twilight meal sitting on a sandy beach and then stretching out beneath the stars to a symphony of night crickets if this sounds like your idea of heaven, a camping vacation in Cyprus might just be just for you. Nature really comes alive when you experience it first-hand. What better way is there to commune with the outdoors than to pitch a tent and take in the profound beauty of an Eastern Mediterranean island? It will give you a vacation to remember. Cyprus has several licensed campsites accommodating both tents and touring caravans. Most of the sites have showers, washing facilities, toilet blocks, snack bars/restaurants, and a mini-market within easy reach. The camp site located in Coral bay, 11km north of Paphos, It is close to the Coral Bay beach and open all year with space for 47 tents or caravans. Facilities include electricity, warm showers and a restaurant. The camping site is situated on the beach in a pleasant eucalyptus grove, (500 metres from Polis town centre). It has the capacity for 200 tents. The site has toilets, showers and washroom facilities for dishes etc. There is a launderette in the nearby town of Polis. There is a snack bar on the beach and a mini market is open from June to August. Open from March till the end of October (maybe longer, weather permitting). Guests can enjoy the on-site restaurant, with packed lunches available on request. A mini market is also available on the site. other facilities include a beach volley field. The Akamas National Park is only 17 km from the property while Latsi Harbour is at a distance of 3 km. 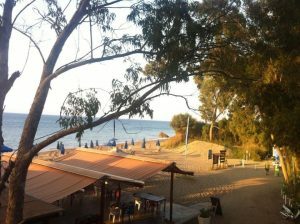 The nearest airport is Paphos International Airport, 46 km from the Camping Site Polis Chrysochous. This property is one of the best-rated locations in Polis Chrysochous!. This property is highly rated for good value! Guests say you get more for your money here than at other site in the Polis Chrysochous area.